You may have a different transmission but the sensor is in the area. Ok thank you, I will crawl back under it 2morrow and see if It is the crankshaft sensor. 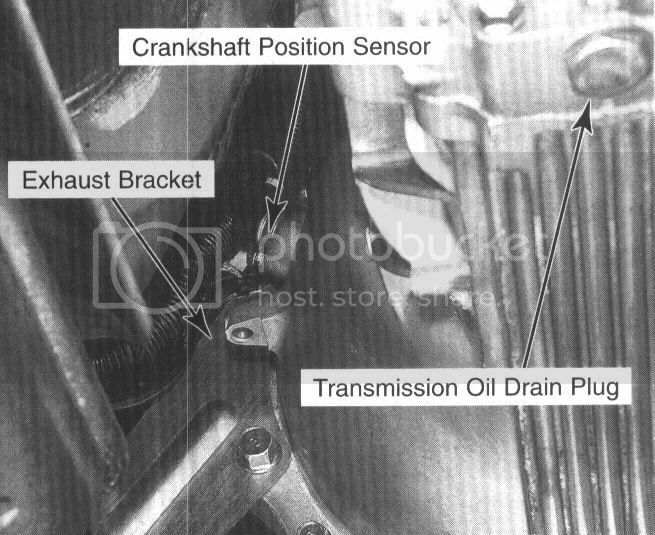 Do you have a picture showing where the crankshaft senor is with a 2.0l SOHC Fuel Injection motor? I already gave you one. But there is no sensor, running from there. Sounds like you just need to let someone else look at the car. That picture came directly from the service manual. ok, there in the clearing between the transmission fluid pan and the bracket, my muffler is running there. Does the sensor that bolts in place, bolt to the transmission? It bolts to the bellhousing at about the 11 O'clock position right close to the block so it can read off the flywheel. mines an auto and it don't have a bellhousing, i believe a straight gear has that. I believe I found it. The part that bolts in is right behind my transmission dip stick, and it takes a 10 mm to get that bolt off. Had to take off my front driver side tire, and pull the mud shield, to get to it. It is a cramp up space to work with and it will take me a while to get it off. Then i just have to find where it plugs into. This job is obviously beyond your ability and understanding so I suggest you have it repaired at a reputable shop. No I understood what you where saying, but the picture is not the way it looks under my sportage. I ended up calling The mechanics at the Kia dealership and they walk me thru it. but anyways I found it, with the help from you and the Kia mechanics.